Kathryn Atwood’s book Women Heroes of World War II is a story of the strength of women in even the most terrifying circumstances. 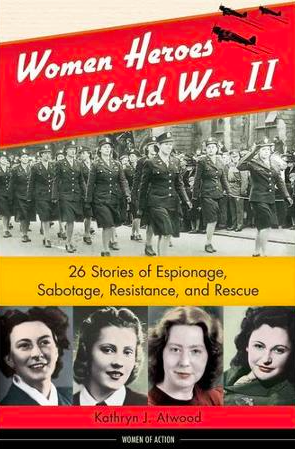 The book’s subtitle explains the content: 26 Stories of Espionage, Sabotage, Resistance, and Rescue. Women from seven European countries and the United States are included. It made me wonder if the adrenalin that must have flowed through their bodies as they were almost captured and risked their lives might be a secret elixir of life. But, then perhaps it is simply a matter of perspective. There are only 26 stories in this book, but there must be many more. Perhaps only those who lived long lives could finally put their dangerous and gruesome memories behind them and tell their stories.